The Chilean wigeon, Chiloé wigeon or Southern wigeon ( Anas sibilatrix – Poepping 1829) is a nice looking duck belonging to the vast order of the Anseriforms (Anseriformes), to the family of the Anatids (Anatidae), to the genus Anas and to the species Anas sibilatrix. The name of the genus Anas simply comes from the Latin name “anas” = duck, whilst that of the species sibilatrix comes from the Latin “sibilus” = hiss, whistle, and therefore he who hisses, with reference to the cries emitted by this species, that are “hissed whistles”. The Chilean wigeon gets its common name from the island of Chiloé (and from Chile) located in southern Chile and is indigenous, besides the Chiloé Archipelago, to the southern part of South America. It mainly nidifies in Argentina, Uruguay and Chile. It scarcely nests also on the Falkland Islands. Vagrant specimens have reached the South Orkney Islands and the South Shetland Islands, South Georgia and the extreme south of the Antarctic Peninsula, where they have sighted in 1980 a specimen of Chilean wigeon haunted by a Brown skua (Stercorarius antarcticus). 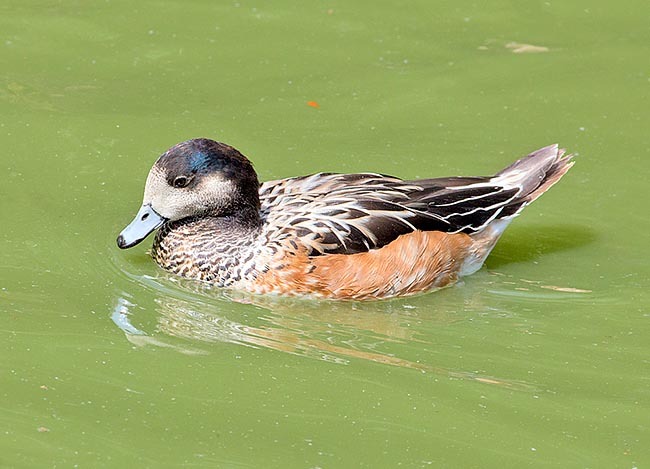 The Chilean wigeon lives in an ample variety of habitats with humid areas even if the countries-steppes with vast scattered lakes-lagoons-swamps, with presence of trees and with adjacent banks with meadows with low grass that are the preferred ones. This duck loves the aquatic zones with thick aquatic vegetation and with vegetation forming floating surfaces but also woody zones along the slow-flowing rivers. The Chilean wigeon nourishes also in open seas on the platforms-forests of kelp (seaweeds belonging to the genera Macrocystis, Laminaria, Ecklonia, Lessonia, Alaria, Eisenia), especially in the Falkland Islands. This duck, in its origin countries, is also called with the term of mottled duck or royal duck, even if with this last term is indicated also the Mute duck (Cairina moschata). Its shape is compact and is usually heavier than the two northern wigeons. With respect to the latter, it has a rather triangular head instead of rounded. 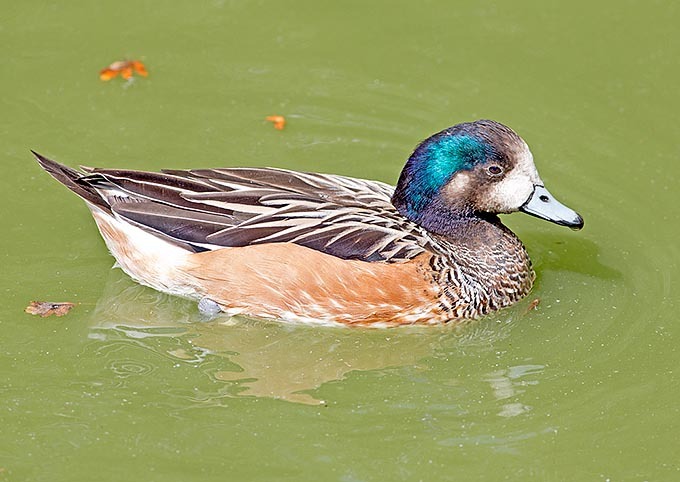 This duck has a length of the body of about 45-56 cm, with a wingspan of 75-86 cm, the length of the wing is of about 25 cm and the weight is of around 800 g.
The Chilean wigeon has a quite coloured livery; the head has lateral vertex (to form a sort of wide superciliary “comma” ) iridescent green-blue on dark basis with white cheeks and front. Plumage around the eye conrtinuing in a sort of vertical stripe and latero-distal portion of the head of brown-greyish dark shaded; of this colour is also the upper front. There is a white-whitish auricular spot. The neck and the occipital part of the head are black-blackish. The chest is finely white-black barred. The plumage of the wings and of the back is white-black forming black oblong drawings edged of white-rimy white. The sides, on white base, are of reddish rust colour. The reddish colour may be present also on the zone of the thighs and in the undertail. Black-blackish tail and white overtail with slight and sparse dark spotting. The underwing is grey-pale brown more shaded of clear in the median-anterior part. The bill is grey-light blue-bluish with borders, nostril and tip are black. The iris is dark brown. The legs are grey. Even if the two sexes have similar livery, the males distinguish from the females being bigger and having, usually, a somewhat more luminous , paler and glossier livery. The green of the head is more marked in the male. These ducks are easy to identify when flying thanks to ample white spots, shaped like a crescent, present on the back of the wings and very evident when the same are spread, these spots are most conspicuous in the males. The young specimens have a livery similar to the adults but the typical rusty colouration of the sides is reduced or absent. The common name of “wigeons” identifies some species of ducks (3) belonging to the genus Anas. Such name though having an unknown origin is maybe of French origin and refers to the hissing vocalizations typical of these ducks and more acute in this species than in the two northern ones. The males of wigeon are in fact known for their delicious whistles and the voice of their female companions lacks of the repeated squawking typical of many species of surface ducks even if emitting repeated acute and chattered cries especially while flying. 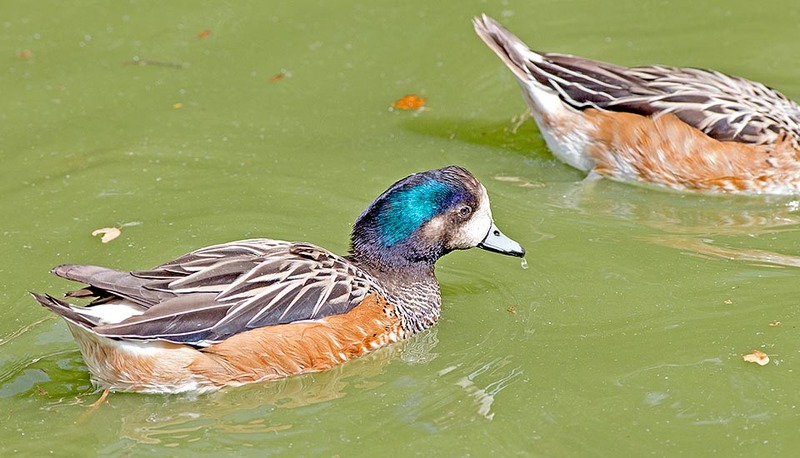 Two of the three species of wigeons (those not treated in this text) reproduce in the high latitudes in the grassy lands respectively of Eurasia (the Eurasian wigeon, Anas penelope) and of North America (the American wigeon, Anas americana). The Chilean wigeon is the only wigeon with southern distribution. All wigeons have alimentary habits almost exclusively vegetarian and the two northern species are the only northern ducks to graze, in compact flocks and often by night, on grassy zones with low grass. The habit of nourishing mainly of grasses torn to the ground makes the wigeons the smallest aquatic birds with highly grazing habits; the Chilean wigeons amply graze on the ground even if less intensively than the other two species of wigeons. The compressed bills, tapered and relatively small (similar to the geese ones) of these ducks are ideal for grazing; the mandibular indentation are excellent for tearing off the grass. The wigeons have a rather suspicious nature and swim with a more erect posture in respect to most of the surface ducks. When they fly, the wings emit swishes. Contrary to the two northern species of wigeon that are very dimorphic, in the Chilean wigeon the dimorphism, especially at level of plumage colouration, is decidedly less marked. Furthermore, the Chilean wigeon does not present any eclipse plumage. Besides rapid and typical whistles, the males emit some distinctive vocalizations similar to neighings during the courting and as alarm “calls” . The wigeons vocalize almost continuously also while flying or by night while feeding; when the ducks gather in ample congregations ensues a strong wild choir-clamour. Even though the Chilean wigeon has more or less sedentary habits, some limited winter migrations may occur with specimens moving nortwards up to Uruguay, Paraguay and South Brazil. Whilst the resident ducks live mainly in the plain, some important areas frequented also as moulting areas are the piedmont highlands east to southern Andes and Patagonia. The Chilean wigeon has social habits, but during the reproduction. Flocks even of various hundreds of units may assemble during the migration and in the wintering areas. The flocks gathering in the period of the moulting may count 5000 specimens without any way reaching the impressive numbers characterizing the two similar northern species. In the continent, the reproduction begins in August-September; in the Falkland Islands, on the contrary, they nidify from September to December. The pair bonds are so much strong that the pairs live together also out from the reproductive period (it is therefore thought that the pair bonds are probably permanent). The nests may be done even at remarkable distance from the water; they are well hidden among the high grass or into the bushes. The hatching is formed usually by 6-10 white-cream eggs that are incubated for about 24-25 days. The ducklings are brown with white-yellowish dorsal spots and ventral parts; the head is of a nice leather reddish colour with a brown dorsal line, a thin brown line crosses also the eye. The bill, in the ducklings, has already the drawing similar to the adults one. Both parents care the progeny; they have seen even males accompanying alone on the hatching (cases where the female had probably disappeared). In some zones the pairs may breed a second annual hatching. This species is fairly abundant, a census has relieved almost 19.000 ducks in a single Argentinian site; the overall population is estimated in being between hundred thousand and one million of specimens. The Chilean wigeon, being a very graceful duck, is rather diffused in the aviaries all over the world.